Evapotranspiration is composed of two parts: evaporation and transpiration. Transpiration is water which passes through the plant root-stem-leaf system and then into the atmosphere. It’s necessary for plant growth. Researches show that for a given year, climate, and location, a vegetative type crop produces a yield which is proportional to the amount of water transpired. A field of alfalfa which is stressed for water will not yield as much as an adjacent field which is not stressed. There is a limit to crop transpiration rates. They depend largely on climatic conditions such as solar radiation, wind, temperature, and relative humidity. They are also highly dependent upon the soil fertility. A crop cannot be forced to transpire more water than the atmosphere is capable of absorbing and transporting. Peak summertime transpiration rates for most field crops typically vary from a quarter to a half an inch per day, depending upon the climate and crop. Crop water use (transpiration) under an “inefficient irrigation system” is NOT higher than under an “efficient irrigation system“. Irrigation system inefficiencies are caused by poor distribution uniformities of application, irrecoverable losses such as EVAPORATION or WIND DRIFT, excess applications which cause deep percolation below the potential root zone, or non-collection of runoff water. Poor design or management of an irrigation system may result in a farmer applying more water than with a better system or management but will rarely result in the crop using more water. In fact, transpiration under a very good irrigation system is generally higher than under a poor irrigation system. High transpiration rates are not bad; a main purpose of irrigation is to increase transpiration and yields. At high soil moisture levels, the water is held by the soil with very low energy (tension), and therefore it is easy for the water to move into the plant roots. Coarse textured soils may not hold very much available water , but most of what they do have is held at very low tensions. Seventy to eighty percent of the available water on a coarse textured soil may be depleted before the plant begins to reduce transpiration, but transpiration reduction may begin when only thirty percent of the available water is depleted from a clay. Good fertility is necessary to have a healthy plant. Osmotic forces due to salt in the soil water create the same effect as a dry soil, and make it harder for water to move into the crop root system. Irrigation systems which apply water frequently to crops can mantain relatively constant, high soil moisture levels in the soil. Therefore they contribute to higher transpiration rates. Drip, center Pivot, and solid set sprinkler irrigation systems can fall under this category because they are capable of applying water every day or every few days. Linear moves fall between center Pivots and standard furrows because they generally require several days between passes. 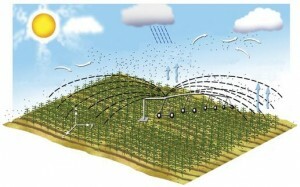 Other systems such as furrows or hand move sprinklers tipically have a long interval between irrigations and therefore may have less transpiration. However, management techniques such as using alternate furrow irrigation (irrigating every other furrow, every other time) can be used to effectively cut the irrigation interval in half. Irrigation systems which are managed to apply water relatively infrequently will not reduce transpiration and yield if the root zone is deep and if the “infrequent” (not every day) irrigations are properly timed so that the soil water tensions do not reach the critical level. One response to "Transpiration and irrigation systems"
Drip irrigation is the type of irrigation I use. It allows the water to slowly drip to the roots of the plants.